Moving from an apartment building to having a yard can be exciting. You’re already thinking about buying a grill and a fire pit and inviting your friends over for a beer. Just hold on … first review our tips about buying a home with a yard and then you can throw your party. To avoid having any regrets or problems once you purchase your home, carefully look over the property during your first viewing. Don’t be swayed by a home that seems perfect in every other way and ignore any landscape issues. Don’t focus just on issues with the home itself and end up overlooking the yard. It can be a costly mistake — removing a diseased tree or repairing drainage issues can be expensive! Trees – Healthy or Hazardous? Mature trees can add value (and shade) to a home but with them can come some serious issues. A simple question, “Is it a safe tree?” needs to be answered. Believe it or not, it can be hard to tell if a tree is healthy or not on your own, so hiring an arborist is a good idea. They can give you recommendations if it’s safe and, if you purchase the home, how to care for your trees and keep them healthy. Most homeowners don’t want to remove an old tree but sometimes they have no choice. Unhealthy trees can pose a risk of falling on your home, cars, or even power lines. Some trees only need to have limbs removed to avoid any trouble. You’ll need to factor in the cost of trimming trees every few years as part of your budget. Some things to look out for when viewing a property’s trees: top-heaviness, root damage, cracks or spits in the trunks, decay, hollow areas, dead limbs, fungal growth, and damage. Keep in mind, tree roots can damage the foundation, walkways or patios. And the roots of very mature trees can cause damage to sewer pipes buried in your yard. This can be pricey to fix! Drainage – Poor or Good? Dealing with water damage inside your home can be a nightmare, and outside drainage issues could be the cause! If a home has poor drainage, water will seep into the basement and your yard could be unusable at times being water soaked. What’s important to look out for? First and foremost, the yard should be graded so that it slopes away from the home so that runoff from stormwaters don’t pool near the foundation (or on your patio!). Do you see wet soil near the foundation and erosion on the home? Also check to see if there’s an irrigation system such as underground French drains where runoff water can flow away from the house to the street. Many properties have these installed and they are a great way to solve drainage issues in a yard. However, find out if the pipes are working properly and water is not overflowing due to a clog or breakage. Next, determine if the home is in a floodplain or a flood-risk zone. Most municipalities can provide this information on a home’s lot. The possibility of flooding from stormwaters or a rising river is something you want to be aware of before you buy a home. Hardscaping Condition – Cracked or Sound? Hardscaping includes patios, retaining walls, walkways, and driveways. All are integral features in a property that add can value to a home but also play an important role in the function of the home. These features also can influence the entire look and feel of the yard. Who doesn’t love a flagstone patio or a driveway with pavers? But beneath all that beauty could be damage that costs money to repair or upkeep. Walk around the property and really look at the condition of the hardscaping throughout. Are there cracks in the driveway, missing pavers, or is the retaining wall leaning? If there’s a pool, you should get it inspected by a professional. Nowadays a pool doesn’t add as much value to a home if you’re thinking resale. If you want a pool and know your family will enjoy it, then go ahead and purchase the home. There are several do’s and don’ts to keep in mind when looking at a property’s characteristics. Not only consider the lot’s size but also its shape and where the home is situated on it. Avoid odd-shaped lots and weigh the pros and cons of having a home with more front yard than back yard or vice versa. Really think long and hard about buying a home on a slope. We’ve already discussed water issues but a sloping back or front yard can also affect how you use the space each and every day. Walking up a long flight of stairs with groceries or having no level space in the backyard may not be enjoyable for you or your family. Green Space – What’s Important to You? Here’s where it gets personal! You need to ask yourself what are you needs and wants when it comes to the outside of your home. Do you want a big yard for your kids and dog to run around in? Do you want entertainment space with a patio or deck or fire pit? Do you mind mowing a large lawn or hiring someone to do it? Do you want space for a garden? Once you’re the homeowner, you’ll be responsible for taking care of everything from the lawn to raking the leaves. Will you want to spend your time doing this or will you have the money to hire someone? Having a yard, big or small, is additional work and money for a homeowner. Your budget should factor in everything from the tools (shovels, rakes, lawnmower) and services (for your lawn, trees, shrubs) that you’ll need. Sometimes a home with gorgeous, intricate landscaping may be too much of a good thing for you to upkeep in terms of time, money and know-how. The yard may look perfect when it’s listed but what will happen once you’re the owner? If you envision yourself outside enjoying your yard and relaxing, consider how important privacy is with this vision. 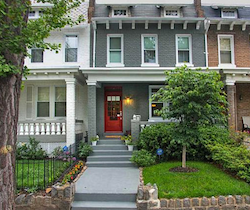 Many homes in the DC area are close together. Is there a fence or foliage that gives you more privacy from neighbors when you’re spending downtime with family and friends? Does that matter to you or not? If you follow our tips, buying a home with a yard can offer you so much enjoyment of being outside all year long – from building a snowman in the winter, to jumping in leaf piles in the fall to savoring your weekend coffee on your patio in the spring. Let us know if you have any questions about purchasing a home with a yard.